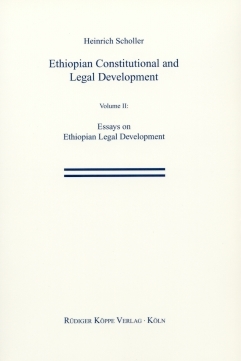 In this publication the author gives an overview for the Ethiopian law student and the wider public on the modern law of their country. This access to modern law in Ethiopia should, however, not be separated from the historical legal tradition and legal culture of Ethiopia. During her history she has developed several remarkable codifications like the Ser’ata Mangest or the Feta Nagast, by which Ethiopia joined the family of Roman Law. This second of two volumes therefore extends the presentation of modern law in Ethiopia to legal history and legal sociology as well. It is possible to use the two volumes not only for constitutional law, but also for legal theory. Basic elements and principles of the Ethiopian codification process are discussed in chapters on the Civil Code, the Commercial Code, the Penal Code and the Codes of Procedure. A chapter on the reception of law in French is integrated in the first volume which shows that the French language is still very important in this context, because these codes were developed and drafted by French speaking legal experts like Réné David and Jean Graven. Some of the articles of this publication were written only recently when the author was involved in a series of important workshops for the new Ethiopian law after the downfall of the Mengistu-Regime. The aims of these workshops were the democratisation process and the re-establishment or establishment of the principles of the Rule of Law in Ethiopia.